Description: Fresh from rebuild shops. 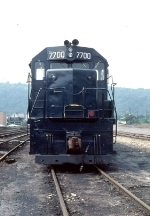 Former SD-35 with non-turbo 645 for use as hump "mother" at Queensgate in Cincinatti OH. Description: B&O SD20-2 recently outshopped, works a cut of cars near Viginia Lane.